These are the largest heavy duty electric pressure washer units in our line. 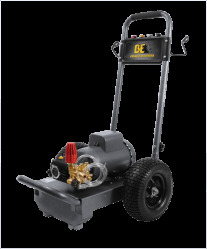 The pressure range can vary from 2,000 to 3,000 PSI, water flow 2.2 to 4.0 GPM and the horsepower 3.0 to 10 HP. 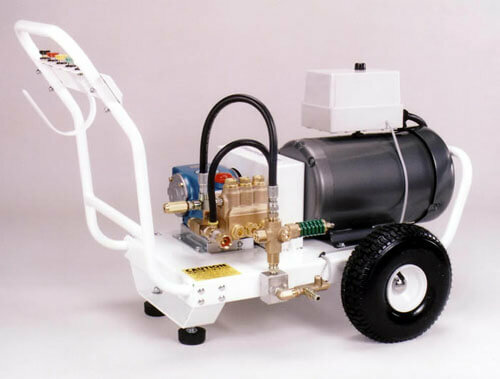 Models are available in 220 V, 460 V and 575 V. They are powered by the electric Baldor motor and are equipped with 4 size nozzles ( 0°, 15°, 25° and 40° tip), trigger gun, pressuehose, and thermal relief valve. Choose from GENERAL or COMET pumps. The unit is attached to a large two-hand handle powder coated frame and supported by two 13" pneumatic tires. Very easy to maneuver. They are perfect for both outdoor and indoor use. 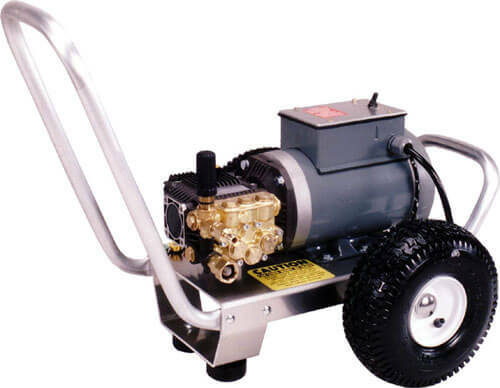 These electric pressure washer models have many great features such as chemical injector kit designed for easy cleaning solution application, 50 FT of pressurehose for convenient large surfaces power washing, thermal relief valve for pump protection, 4 spray tips usable for any type of cleaning job, trigger gun and insulated lance for secure grip and smooth operation. 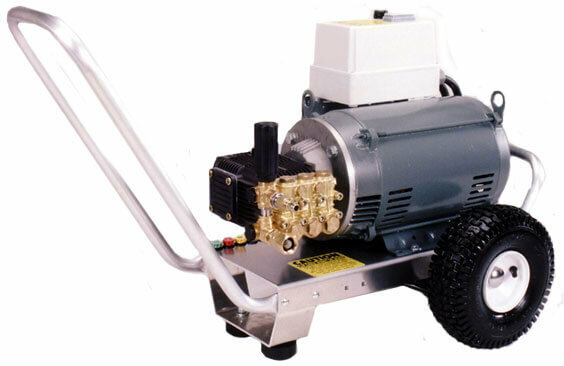 All pressurewashers are factory tested before being delivered to the customer. Choose Voltage (230, 460) in shopping cart. Magnetic Starter with Auto Start / Stop Function and Manual Overload (keeps the motor from ever heating) with Reset Switch. Due to sensitivity of the electrical components and connections please allow/hire a certified local electrician to connect the Magnetic Starter Kit to your pressure system. If any of the components should burn up due to improper installation, there will be no returns or warranty issued. The manufacturer will not cover this item; therefore, Ultimate Washer Inc will not be able to cover it either. Items usually ship within 7 days.